I absolutely love these cleats. They last forever and they’re super cute! Nothing like looking good while playing like a beast! Highly recommend! Fit perfectly and so excited to wear them! We love our Ringors! They are the only cleats that will get my pitcher through an entire year (spring and fall seasons) of softball. Even then, they’re still in great shape...she just grows out of them. Ringors are well-made and the pitching toes are solid and won’t pull apart. We will never buy another brand again. My daughter, who is a pitcher, tried New Balance, as a lot of the girls on her team raved about the lightness and feel. The first pair lasted 45 days before one of the metal cleats came out of the bottom! Guess what, 30 day warranty. We tried one more pair, and again the one of the cleats came out, and they still would not offer us a replacement pair. So, we are back to Ringor (our third pair) and she LOVES them again! They are actually lighter than the NB, and even though she plays 11 months a year, they last a year or more easily. 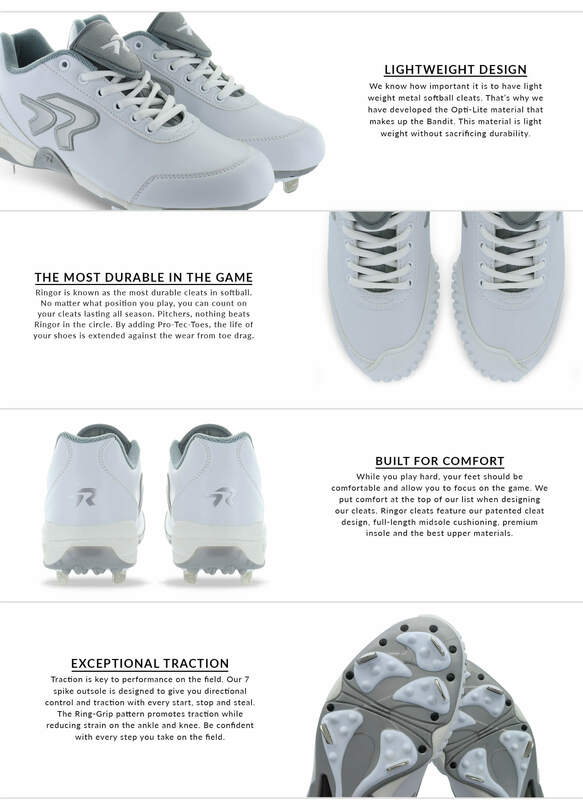 She is very tough on her shoes as a pitcher, but Ringor is far and away the premier cleat for serious softball players. We will never go back to any other brand. The Ringor cleats and turf shoes have been the best in durability for my daughter who pitches for school ball and travel ball. These have been the only cleats and turf shoes that will last her more than one season! Great cleats, as my daughters foot has grown she’ll always ask for new pair of Ringors. She has the metal, molded and turf shoes. Shipping was great! Website is easy to use variation of color made it easy to choose school colors. We have already recommended product to family and friends. My daughter's third pair. All have held up well. Well made.